Diabetic macular edema (DME) is a swelling or thickening of the macula, the small area in the center of the retina, which allows us to see fine details clearly. 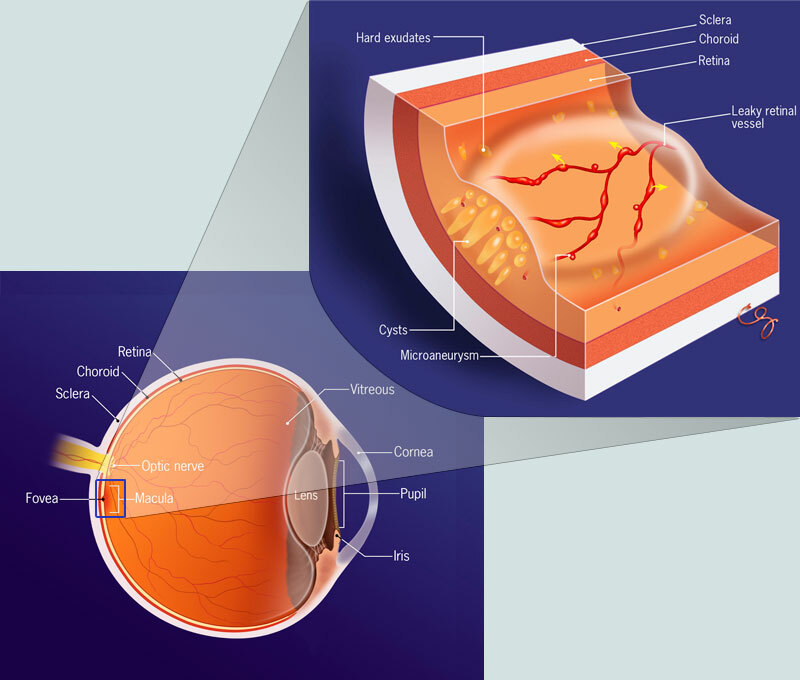 DME is caused by fluid leaking from small macular blood vessels damaged by diabetes, and this causes blurred vision. It is the most common cause of visual loss in diabetes. Vision loss can range from mild to severe, but even in the worst cases, peripheral vision continues to function. Laser surgery is often recommended for people with DME. Choroid – The vascular layer of the eye that lies between the retina and the sclera, and provides oxygen and nourishment to the retina. Cysts – A thin-walled, fluid-filled sac in or derived from the retina. Fovea – The central macula, responsible for very critical vision. Iris – The color part of the eye, responsible for controlling the diameter and size of the pupil. Lens – The transparent structure inside the eye that focuses light rays onto the retina. Macula – A very small area at the center of the retina that allows sharp, detailed vision, such as that needed for reading. Microaneurysm – Small areas of balloon-like swelling in blood vessels of the retina; they often leak blood. Optic Nerve – The largest sensory nerve that connects the eye to the brain, and carries the impulses formed by the retina. Pupil – The black hole in the center of the iris that regulates the amount of light that enters the eye. Retinal pigment epithelium (RPE) – The pigmented cell layer just outside the neurosensory retina that nourishes retinal visual cells, and is firmly attached to the underlying choroid and overlying retinal visual cells. Sclera – The tough white outer layer of the eyeball. Vitreous – A clear, jelly-like substance that fills the middle of the eye between the lens and the retina. The information on this website is provided through direct communication with physicians.